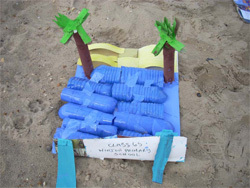 A competition was designed by Rob’s Event Catering to educate and involve children in recycling and ‘keeping our beaches clean’. Rob’s Event Catering run the council catering concessions along Bournemouth seafront. 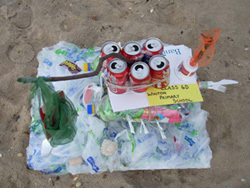 The competition was for children to design and make a ‘sea’ sculpture out of recycled materials which you might find on a beach. 356 primary school children from foundation, key stage 1 and key stage 2 entered the competition, which was judged by Georgina Lamb (Bournemouth Council Recycling Department), Rob Shearman and Helena Demetris (Rob’s Event Catering). 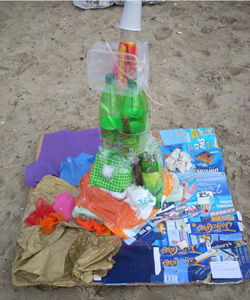 The sculptures were displayed on Durley Chine beach. After the competition had been judged some of the sculptures were taken back to the schools for display and the others were put in the recycling bins, which are provided by Bournemouth Council along Bournemouth seafront.